It’s easier to ‘like’ someone on Facebook than to face a person and tell him or her that you like her. It’s this dilemma that propels two characters in this convoluted love story to pretend as someone else. 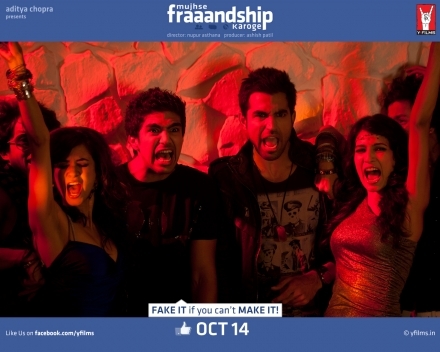 Mujhse Fraaandship Karoge is touted as the season’s ‘most screwed up love story’. It introduces four newcomers: Saqib Saleem, Saba Azad, Nishant Dahiya and Tara D’Souza. The film is made under the banner of Y Films, the youth wing of Yashraj Films. The movie tells the story of two guys and two girls. One is a hunk, the other a geek. One is a stunning fashion student, the other a girl-next-door. What if the geek falls for the fashion swan, and the girl-next-door has a crush on the handsomest hunk of the college?